Our house is on a raised foundation, common on the East Coast and less common in Southern California. 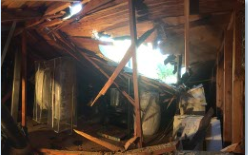 Although the airspace below my house cushioned the blow, the framing around the foundation literally bounced, causing a ripple effect of damage, like in an earthquake, throughout the exterior walls. The result was each doorway, many windows, tile and surfaces throughout, tweaking and cracking. Our Corian kitchen counter popped away about an inch on end. While this felt like a great tragedy at the moment, I quickly realized that everything I would walk through in reconstructing my house would better equip me to recommend renovation and design changes to my clients’ homes. And they don’t need a tree to fall for me to see design potential! The tree fell on the east 1/3 and the resulting impact was visible throughout. In the attic, besides the giant holes open to the outside, the center top beam of the roofline was compromised. Due to the nature of my work, I have an experienced understanding of structure and framing of homes built in all eras. My head was already spinning with the possibilities of how to upgrade, reinvent and improve our home while navigating what would be an eleven-month process for the insurance company to put a value on the loss and repairs. So, it was an exciting day when an engineer was brought in. Finally, someone, I could talk with about my ideas. As he drafted the necessary repairs he also drafted the whole house and property lines in anticipation of my design process. Have you looked at the possibilities of your home? 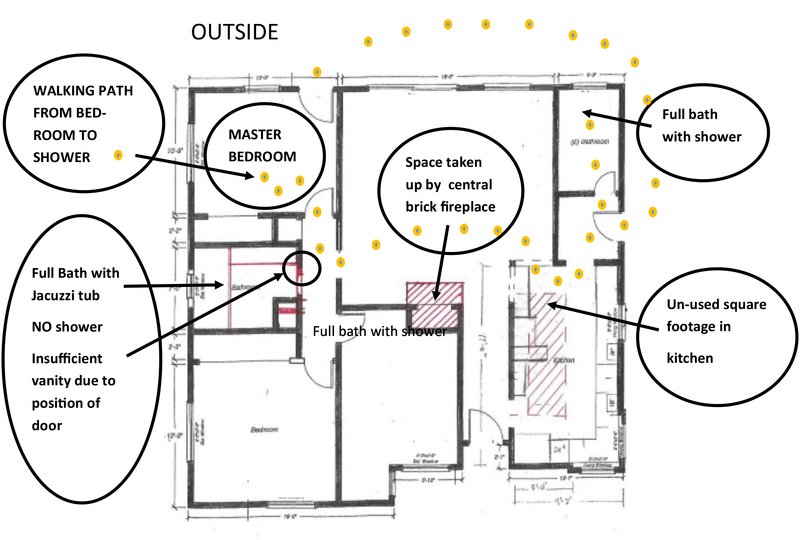 Have you ever drawn up a plan to see what your house looks like, where the hidden opportunities are? By the time the Insurance company gave us the news that they were planning to demolish both our bathrooms, the kitchen and many walls and ceilings, plus a completely new roof – as our 20-year old roofing material could not be matched – and paint and repair the myriad of cracks around the exterior, I had created a variety of plan options for renovation. They ranged from minimal, to adding square footage, depending on what the negotiated settlement would come to. I was amazed at how many options started coming once my eyes were opened up to the possibilities both literally and figuratively. I’ve always known our house was quirky but did not realize the inconveniences; of crossing the living room from the master bedroom to access the only shower or the old brick fireplace which was taking up almost 288 cubic feet of our limited space without adding any efficient heat value. Yes, we have an occasional need for heat in LA winters. My first focus, though, would be the kitchen, lacking pantry space or ample cabinetry. The amount of square footage in the kitchen was full of potential I never thought I would get to explore. Who knew a complete disaster would be one of my greatest opportunities!